Now that you’ve identified the relevant details from your Giftedness Stories, you need to determine which ones repeat and recur throughout your stories. 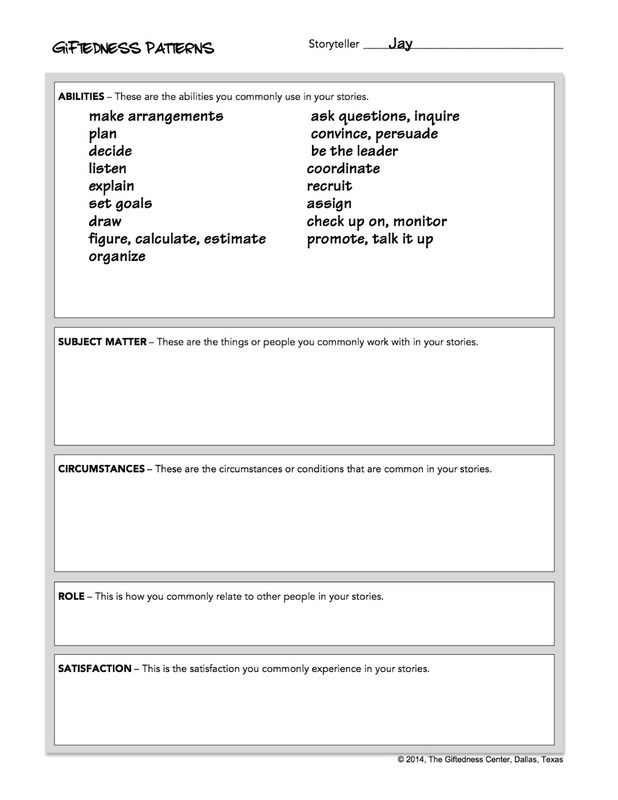 It looks similar to the Giftedness Story Summary form, but it’s designed for you to collect your observations from all of your stories onto a single page. So you just need to make one copy of the Giftedness Patterns form. Lay out the eight Giftedness Story Summaries that you and your partner completed. Look at the abilities listed in the box for Abilities on the first Giftedness Story Summary. Compare those abilities to the abilities shown on the second Giftedness Story Summary. Then do the same for the third through the eighth summary forms. What abilities do you see repeating and recurring? Note that you may not have used the exact same words to describe an ability, but it’s obvious from the stories that the same or a similar ability is involved. What ability is this woman consistently using throughout her stories? Baking or cooking. She only uses the term “baked” one time (in Story 4), but it’s obvious that baking is an ability she regularly uses. If you’ve provided enough detail in telling your stories, you should see certain abilities repeating in at least three or four stories, if not more. If you don’t see any abilities repeating more than once or twice, you need to go back and provide more details about how you did the activities in your stories. Don’t speak in generalities. Get specific. Describe exactly what you did, even if it seems obvious to you. As you and your partner start seeing abilities repeat and recur, list them in the box labeled Abilities on your Giftedness Patterns form.